Goodwill Industries of Southeastern Wisconsin, Inc. has selected the Inspect2GO (http://www.inspect2go.com/food) Food Safety/Health Inspection App to inspect U.S. Navy Galleys. The iPad app includes walk through inspection checklists with photo and note taking capabilities. Upon completion of the inspection process, the iPad app stores the data on a web server for reporting and data analysis. The iPad app will reduce our costs and improve food safety for our Navy Sailors. Inspect2GO’s Food Safety Inspection App (http://www.inspect2go.com/food) has been selected by Goodwill Industries of Southeastern Wisconsin, Inc. (Goodwill Great Lakes), for inspection of Galleys at Naval Station Great Lakes. The iPad-based software eliminates paperwork and improves efficiencies in logging all information electronically, during kitchen/galley inspections. This specific application is configured for daily, weekly and monthly inspections. The food safety inspector walks through the kitchen/galley following an extensive checklist. Items are checked and notes/images are taken where issues arise. Previously, these food safety inspections were performed using a clipboard and a separate camera. With Inspect2GO’s app, paperwork is reduced, the process is streamlined and the data is stored accurately and permanently. The U.S. Navy, Goodwill and NISH are partnered at Naval Station Great Lakes through the AbilityOne Program. This program provides employment opportunities for individuals with significant disabilities. Through training and workforce development support, Goodwill professionals work closely and directly to assist program participants to overcome barriers so they become independent and self-sustaining individuals who contribute to their communities. The U.S. Navy and Goodwill have been partnered for 14 years providing food service at Naval Station Great Lakes. Nearly 700 people with significant disabilities are employed by Goodwill Great Lakes. Last year, operating in 10 galleys, Goodwill served 8.9 million meals to recruits and Sailors at Naval Station Great Lakes. Inspect2Go, Inc., is a mobile application development company based in Southern California. The firm’s technology includes inspection checklist mobile apps with signature, photo, markup, pdf email, database and custom reporting functions. The checklist apps are compatible with Apple iOS (iPhone, iPad) and Android. 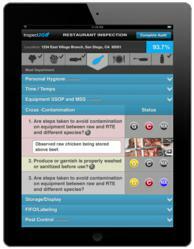 Inspect2go’s EHS (Environmental Health and Safety) software is focused on HACCP and Food Safety Inspection. These include custom HACCP audit applications, sanitation and hygiene apps, hospitality audit inspection checklists, workplace safety checklists and kitchen inspection applications. Specific apps based on USDA/FDA guidelines can be tailored to unique school cafeteria, hospital, hotel, restaurant, special event and wholesale food processing needs.